The UK automotive industry is currently undergoing an enormous shift towards electrified vehicles. This is largely due to the Government’s proposed 2040 ban on petrol and electric cars in a bid to improve air quality. In addition to regular motorists, this will also impact the delivery industry, so organisations will need to begin looking at eco-friendly lorries and trucks to make their deliveries. Hybrid electric trucks are an excellent solution in the UK as they use hybrid electric vehicle (HEV) technology as opposed to combustion engines which is much cleaner. This is key, as petrol and diesel trucks are highly polluting and the demand of the industry means that they spend a significant amount of time on the roads. In fact, commercial vehicles and heavy-duty trucks contribute to nearly 20% of greenhouse gas emissions yet they make up less than 5% of vehicles on the roads. Hybrid electric trucks are now becoming increasingly more popular as more and more businesses and individuals are becoming eco-conscious. 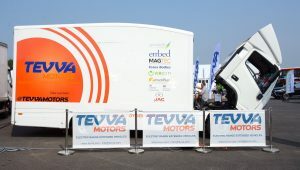 Hybrid electric trucks are a great solution for larger trucks that travel long distances as the range of purely electric vehicles remains a concern, whilst smaller vans should be fine with fully electric vehicles. Many companies and local authorities have started to invest in electric and hybrid electrics with some London routes now only having electric buses. In addition to the 2040 ban, this is a smart move as it allows companies to save money in terms of fuel whilst also improving brand reputation. With this in mind, it is easy to see more and more companies begin to make the switch whether it is pallet delivery, couriers, public transportation, hauliers or any other kind of delivery. Hybrid electric vehicles seem like a great solution ahead of the 2040 ban, but fully electric trucks look set to be the future. Elon Musk, CEO of Tesla, recently stated that the highly anticipated Tesla Semi electric truck will be capable of a staggering 600 miles on one charge, which is certainly enough for a relatively small country like the UK. Due to being such heavily polluting vehicles, it is vital that the delivery industry addresses its transportation as trucks will be capable of cutting pollution faster than cars. This is possible by introducing hybrid electric trucks which are ideal for larger vehicles travelling longer routes and will be an excellent solution until the arrival of fully electric trucks in the near future.